‘Class, Politics and Illiteracy in 18th Century Ipswich’ – Oh! Doesn’t that sound boring? Right then, how about: ‘The Skeleton in the tomb – Digging up the past at the Waterfront’? I was asked to do some historical writing for St Mary at the Quay church down at the old docks (or the new waterfront) in Ipswich. Some Codd bottles had been found, amongst other things, in a dig last year. I had written a couple of blogs about mineral water companies who traded in Ipswich. I like my work as a genealogist, but this was an opportunity to write about history, what I had always wanted to do. I had researched and written about the origin of Codd bottles for the history project and attended an open day at the church to answer questions about them, which was all very straightforward, but this was different. I've had trouble getting ‘into’ the subject. The subject is Charles Jobson, born in c.1773. 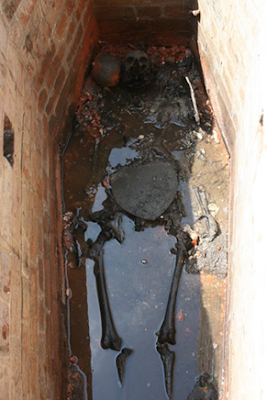 He lived in Ipswich all his life, traded in the town and his bones were buried in a tomb in the churchyard of St Mary at the Quay in 1832. It was my job to bring him back to life - in the literary sense. Charles Jobson as he was found in his tomb. I think most of my problems stemmed because I didn’t do my own research. I was handed ten A4 pages full of dates and details in timeline form - the research had already been done and I didn’t know or understand Charles Jobson or that time in history (everything I had learned about the 18th century at university was well past it's use by date!). Previously my interest had been in the Victorians, (those people who gave us hypocritical moral standards and consumerism). But now I needed to find out about the people who lived before, the Georgians, the ones who reinforced class divisions and gave us party politics. Those people who sewed the seeds for the industrial revolution and made the Victorians who they were. So, where did I start? Here was a man who was a Freeman of the town, a Water Bailiff, an Importer of salt fish from Iceland using his own boats and a man rich enough to be buried in a substantial tomb. Yet, he was also a Tavern Keeper who lived in his own tavern and who couldn’t write a word! This life of his seemed to contradict itself at every turn. Was he respected or scorned? How and where did he fit into the community of Ipswich? I’d got an awful lot to do to understand his life and do his memory justice. Charles was born c.1773 in Ipswich. We know from a record of the Freemen of Ipswich that his father was William Jobson. Charles married Ann Ramsey at St Mary at the Quay on 29 May 1796 both Charles and Ann signed their names with a X. Charles’ father William was buried at St Mary on 8 March 1809. Charles had a son, also named Charles, who married Mary Wade from St Mary at Stoke parish in 1821. Charles junior, a Mariner, like his father and two generations of male ancestors before him, also became a Freeman in 1819. His daughter, Mary Ann married James Trott in 1823 who was Master of the Brig Union at Woodbridge. His daughter Caroline married John Bush in 1828. His daughter, Charlotte, married John Randall in 1829. On 30 August 1831, Charles’ wife Ann died at the age of 56 and was buried at St Mary. On 12 June 1832 Charles married Jemima Hamblin, a widow of St Peter’s parish. Jemima carried on Charles' business at the Smack Inn after Charles’ death. Charles died on 28 August 1832, aged 59, and was buried in the tomb where he was found in 2014 in the graveyard at St Mary Quay. In the late 18th /early 19th century there were only two political parties in England, the Whigs and the Tories. 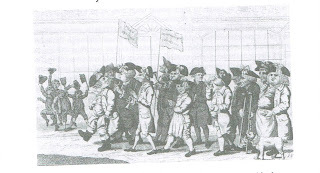 The Whigs (the Yellows) tended to be religious dissenters, financiers, businessmen and naval officers. They attended Cambridge University and later supported the idea of the supremacy of parliament over the monarch, the abolition of slavery and expansion of the franchise (suffrage). The Tories (the Blues), on the other hand, tended to be conventional in their beliefs and regularly attend the established church. They were supporters of the gentry and the monarchy and attended Oxford University. 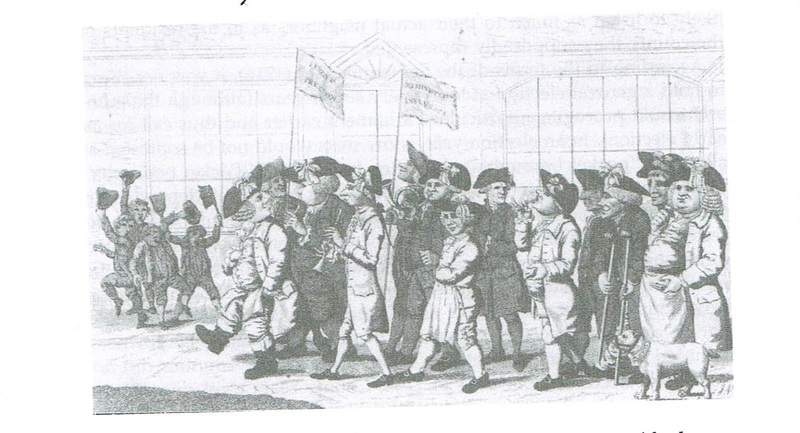 Each party read their own newspapers and had separate parades, theatres and clubs. Politics at that time was very corrupt. I’m sure most of us have seen the ‘Election’ episode of Blackadder (season three, episode one), if you haven’t, it will give you a good (if exaggerated) idea about the politics of the time. (William Pitt the Younger was actually 24 when he became Prime Minister and he wasn’t half way through his exams!) Nothing was thought about bribing, bullying and blackmailing to get a vote - it was all quite acceptable. It wasn’t until the Reform Act of 1835 that politicians became the truthful, honest and trustworthy individuals we know today (if only!). In Ipswich, it was the Municipal Corporation which played the central role of governance. It regulated trade, maintained the commercial infrastructure and cared for the poor through the parishes. It controlled the economic and social lives of all the inhabitants of the town. Most power was held by the senior and administrative officers and beneath them were the ‘official servants’: the policing and enforcement officers, the revenue and market supervisors and the parish officers. Most, but not all these positions were taken by the Freemen of the town. Freemen (originally a serf who had earned freedom from his feudal lord) comprised of about a quarter of the town’s adult male population. There were two ways to become a Freeman, by patrimony (because your father was a freeman) or servitude (you served an apprenticeship). Freemen had rights and privileges that set them apart from the rest of the inhabitants of the town. Not only were Freemen allowed to trade and manufacture without the restrictions that were put upon others, but perhaps the most important aspect of being a Freeman was that you were entitled to vote at the Great Court. Because of the shady state of politics at that time, Freemen were regularly ‘wined and dined’ and entertained by either party in order to acquire their vote. Another benefit of becoming a Freeman was that you could be appointed to hold office by the Corporation. About 6% of freemen held one or more positions of varying authority in Ipswich. Charles Jobson was a Freeman, he was made a Freeman in 1794 at the age of 21 on the ground of patronage - his father was a Freeman. Charles also held the position of Water Bailiff. His father, William and his grandfather George, as well as being Freemen, held that same position of Water Bailiff continuously from 1753 right into 1790, you might say they had a job for life! Water Bailiffs were part of the lower tier of government - something like a Customs and Excise Officer today. He would make sure that the correct taxes were paid on boats and regulate and supervise the port. (I wonder how much of an advantage this was for Charles? We know from newspaper records he had his own ‘fleet’ of smacks and brigs.) Water Bailiff was a respectable title, the position gave a modicum of power, an extra income and a chance to rub shoulders with those of a higher status. There are newspaper articles recording Charles running for the position of Water Bailiff on behalf of the ‘Blues’. If you were a Tory at the end of the 18th century you were very likely to have been a devout Christian. Charles would have attended church regularly and led a rather spiritual life with his family. His attendance and connection to St Mary would have played a big part in his life socially as well as spiritually and the parish of St Mary Key (as it was sometimes known) would have been quite a 'tight knit' community. However, religion was irrelevant when it came to business. The lady who did the research on Charles, Frances Torrington, spent many hours at the Suffolk Record Office getting to know Charles. She told me that she thought Charles seemed a bit of ‘Del Boy’. Although I doubted this at first, seeing as he was a Freeman and Water Bailiff, the more I have learned about Charles, the more I agree. He was certainly an entrepreneur and took advantage of all sorts of business opportunities including buying and selling property, selling boat paraphernalia, importing salt fish from Iceland and probably numerous other business activities which we’ll never know. Although the first records of Charles do not state his occupation, later records (Pigot & Co. Directory, 1830) show him as the Landlord of the Smack Inn. In my opinion, inns, taverns and alehouses were just as important to the lives of ordinary people as churches. They were vitally important to the businesses of the lower classes. In the days before telephones, public houses provided a meeting place to arrange work and do business. They served a much bigger purpose than today, they were a place to do business, obtain information, socialise and relax. Here are a couple of sketches of Inn Keepers made around the time Charles would have lived in Ipswich. I wonder if he looked anything like these? Historically, dock areas were associated with crime and therefore not the best place to be – the promenade, further up the river was a much nicer place where the upper class residents would take a stroll. The Smack Inn (roughly where the Premier inn is today) was listed in 1830 under Taverns rather than Inns, although we know it provided rooms for rent. So, perhaps the area is why it was listed as a tavern – not such an upmarket place? Even so, Charles was worried about his reputation. 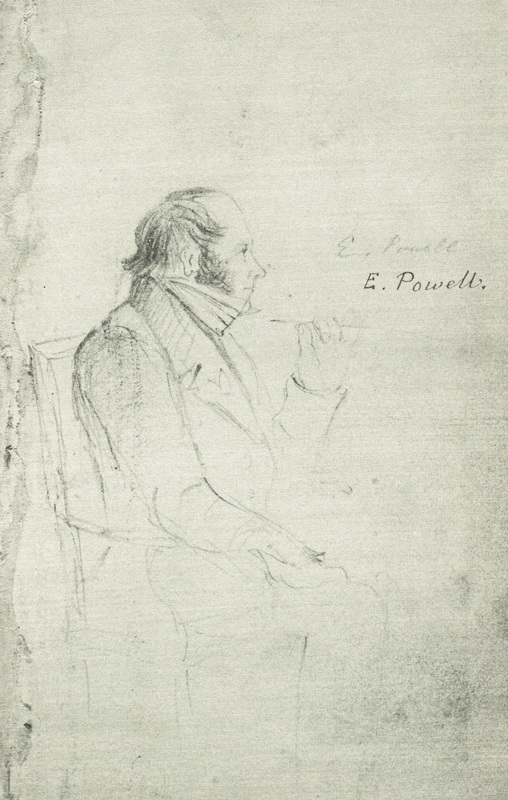 He wrote (or rather dictated - he couldn't write) an article for the Ipswich journal about a fire in a room. Sir, In the Suffolk Chronicle of last Saturday was inserted “that the bed hanging in one of my chambers were carelessly set on fire by a drunken man”: consequently I respectfully beg to assert, through the medium of your valuable Paper, in order to convince my friends and the public in general, to the contrary, - that the person was quite sober, and the accident was occasioned by a spark falling from the candle. I am, sir, Your most humble servant CHARLES JOBSON, Smack Inn, Ipswich 21st April 1826. Hmm… But was he worried about his reputation as Tavern Keeper or Politician? Was 'The Chronicle' a ‘Whig’ newspaper and the 'Ipswich Journal' a ‘Tory’ newspaper? Charles gained 259 votes for the Blue Party on 30 September of that same year! As I mentioned before, Charles had quite a fleet of brigs and smacks coming in and out of Ipswich. But perhaps his finest moment was the launch of his new wherry, the 'Lord Nelson', advertised in the Ipswich Journal on 13 July 1822. She has commodious and neat accommodation and is every way fitted up for the enjoyment of those friends who may confer favours upon which he respectfully solicits ensuring them nothing will be found wanting to contribute to their convenience and comfort, or safe delivery of all parcels entrusted to his care. Select parties wishing for a day’s excursion may be accommodated on the lowest terms. He sold it in 1826! 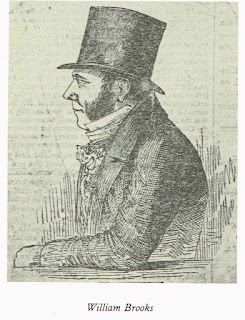 So, who was Charles Jobson and how did he fit into Ipswich society? I like to think that, in some ways, Charles was a ‘Del Boy’ of his time, although obviously, Ipswich in around 1800 was hugely different to 1990’s Peckham! Like Del, Charles perhaps behaved as though he was wealthier or from a higher class than he really was. He must have been rather optimistic, with perhaps a confident and friendly, if sometimes forceful and persuasive, manner which which helped him in his business dealings. In contrast to Del Boy, Charles was a popular fellow in politics (even on the occasions when he lost an election, he had well over 200 votes!) which enabled him to become a respectable member of the community. And even more unlike Del, Charles appears to have been a successful businessman and the fact that he couldn’t write didn’t seem to hold him back at all! This epitaph says to me - Don't worry about material things, on the inside we're all the same, be happy and make the most of what you have. I’d like to think that Charles felt this when he was alive. I think I would have liked Charles Jobson!